Walter Randall and Steffani Randall (1991). 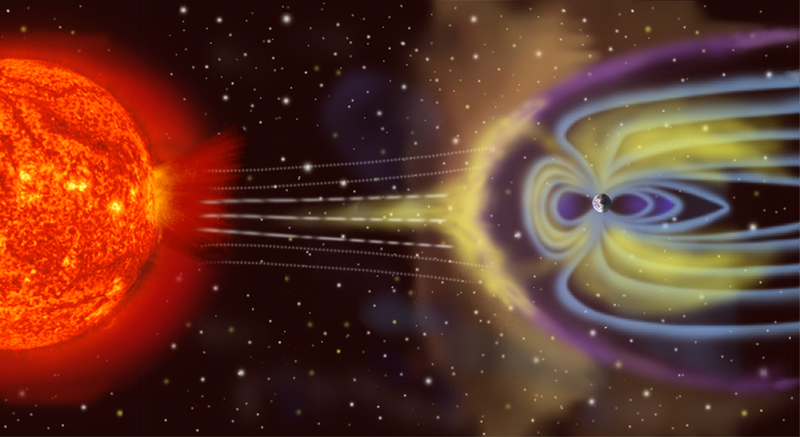 The Solar Wind and Hallucinations – A Possible Relation Due to Magnetic Disturbances. Bioelectromagnetics 12:67-70. Randall and Randall published a study in 1991 which looked at a total of 49 cases of visual “hallucinations” reported by individuals of recently deceased relatives. The cases were taken from a massive survey conducted by the society of psychical research in England back in the late 19th century, and published as the ‘Phantasms of the living’ and a later survey called the ‘Census of Hallucinations’. The cases spanned a 43 year period between 1845 and 1888. The authors wanted to see if possible magnetic disturbances of the earth (caused by solar wind) could be linked with the ‘hallucinations’ being reported. They obtained records of magnetic field variations recorded from the same period as the reported hallucinations. When they compared these two data sets, they found something interesting. When the ‘hallucinatory’ experiences were grouped by the month of occurrence and compared to records of solar wind activity during the same period, the two data sets were significantly correlated (Spearman correlation coefficient 0.64, p<0.5 two tailed). See figure 1 below, taken from the paper. Fig. 1. Total number of hallucinations and the month they occurred are plotted with the average monthly value of the magnetic index aa. A correlation by definition only states whether the two variables (in this case solar wind/magnetic field activity and frequency of hallucinations) are mutually related. Thus the results cannot imply cause and effect, and there may well be any number of other factors which are the cause of the observed relationship. However if true, the data is tantalisingly suggestive that hallucinations, which may at least partly account for haunting phenomena are in some way related to fluctuations in sun-induced natural magnetic field fluctuations. My experience with transcranial magnetic stimulation (TMS) shows that very strong magnetic fields, in the order of several Tesla, can readily affect neural activity which can result in muscle movements or more subtle cognitive changes. It is a powerful technique which is currently being applied (experimentally) to areas such as treating drug resistant depression or helping rehabilitation of motor deficit resulting from stroke. However from discussions with colleagues in the field of TMS and neurology, the possibility of weak magnetic fields (in the order of millitesla) affecting neural tissue is generally dismissed out of hand. There is a strong and consistent attitude that such small fields, yet still an order of magnitude greater than the earth’s magnetic field (which is around 30-60 microtesla) could not have a significant effect. I believe that this is partly due to the currently understood mechanism by which TMS acts on the brain. The strong and rapidly changing magnetic field passes uninhibited through the scalp and when it interacts with the neural tissue, a current is induced to flow. This current when passing through neurons forces them to discharge, and in effect acts as an outside stimulus. Depending on the location of stimulation, this outside stimulus results in physical or perceptual effects such as muscle movements or sensory changes. This is currently the only known, common sense mechanism by which a magnetic field is known to interact with brain tissue. Weaker magnetic fields, ones that cannot directly trigger neural tissue are not seriously considered. However Michael Persinger’s group in Laurentian University, Canada have published numerous papers reporting the effect of low strength magnetic fields inducing semi-religious experiences in participants. His group induced emotional responses associated with temporal lobe activation and possibly deeper structures such as the amygdala, which has an important role in generation of emotional states. All of this activation is believed to be induced by weak, diffuse magnetic fields, but ones with a difference. What is different about these fields is that they are more biologically meaningful. They are alternating magnetic fields created by playing back segments of recorded brain activity via specially designed magnetic coils. The Randall and Randall paper suggests that even weaker (natural) fields may somehow be associated with hallucinations and/or ghost activity. A very exciting prospect because it generates a hypothesis that can be tested by scientific means. However the magnetic field at best can only be a partial explanation. Hallucinations and not ghosts were the topic of discussion in the Randall & Randall paper. Generally the individuals reporting these hallucinations only had a single unique experience. Ghost and haunting activity can be perceived by numerous people, usually occurs multiple times and consists of more than just visual experiences.